Crucifixion was designed as the ultimate in slow, painful and humiliating deaths. 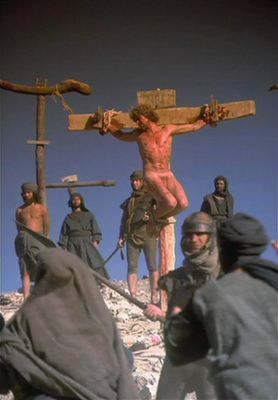 Aspects of the punishment included that prisoners were often required to carry their crossbeam to the place of execution for it to be attached to its stake or tree; that they were crucified completely naked (more humiliating for a Jew than a Celt, and for a woman than a man – though female crucifixions were rare); that, naked, they would undoubtedly empty their bladder and bowels over themselves in front of the crowd who came to watch. The prisoner was tied or nailed by the wrists to the crossbeam. The feet were often nailed to the upright, one one each side, at the ankle. Frequently the prisoner had a block of wood attached to the stake or tree for them to sit on, with a spike sticking up from it to magnify their pain. The execution could last for hours or days, depending on the weather, the prisoner’s condition (such as loss of blood from having the skin scourged off his back) and whether the legionaries guarding the crucifixion were in a hurry to go back to camp. Some ways for the soldiers to hasten death were to break the prisoner’s legs with an iron bar, to run a spear up through the stomach and chest, or even to light a smoky fire below him to asphyxiate him. Once dead, the body was normally left in place as a warning to others, while it was eaten by crows and buzzards. The punishment was in use by Greeks, Persians and others before the time of the Roman Empire. The Romans originally used it only for slaves, but then extended it to pirates and enemies of the state. The punishment was forbidden under Jewish religious law, which only allowed execution by stoning, burning, strangling, or decapitating the victim. So Jesus was not crucified at the wish of Jewish authorities, or of the Jewish people. He was crucified by the Romans as an enemy of the state, which he had declared himself to be by claiming the kingship of Israel while entering Jerusalem. The Romans tacked a sign above his head reading “Jesus of Nazareth, King of the Jews”, to show what they thought of his ambitions. Jesus was crucified between “two thieves”, but you didn’t get crucified for mere theft. However “thief” and “robber” were synonymous with “Zealot”, “sicariot” (or knifeman) and “insurgent” to the forces of the Roman Occupation. It is reasonable to assume that the “thieves” were leaders in the armed wing of the Zealot resistance – but not as prominent as Jesus, and not part of his cadre of preachers. Jesus was stripped naked, and the legionaries diced for his clothing. He was scourged: flogged 40 times with a short cat-o’-nine-tails , each tail ending in a lead ball to lacerate and strip the skin off. He was made to carry his crossbeam to the Place of Skulls outside the city, but he collapsed on the way. After perhaps nine hours of crucifixion he called out “My God, my God, why have you deserted me?” Then he called out again, and died. Joseph of Arimathea negotiated with – or bribed – the Romans to be allowed to take Jesus down for burial, but first the Romans ran a spear up through the corpse to make sure it was dead – this was common practice, and only a dribble of blood and a watery fluid (presumably from the pericardium around the heart) came out. And that was it. The end of just one of a 200-year series of attempts to oust the Romans from Israel. But preachers and knifemen didn’t have much chance against the Roman Empire. This entry was posted in History, Military, Religion and tagged cat-o'-nine-tails, crucifixion, enemy of the state, Jesus, Jews, Roman Empire, Romans, two thieves, uprising, Zealots. The Roman empire also makes a good backdrop for a story. The authenticity of the Jesus story is questionable at best. That does not reduce the barbaric nature of crucifixion process. Describing the crucifixion of the Jewish Christ means nothing without some evidence that he actually existed. Without evidence the crucifixion serves only as an emotion ploy in the plot of the story. It does not matter how he died, not in the least. The point, as the NT authors will tell you, is not how he died but that he died and why. All of that writing could have been spared had they simply wrote that he was executed.It would not change the story one bit nor the essence of the story or its purpose. The ONLY reason to talk about the agony of it is to increase emotional appeal. I find this disgusting. The idea itself was not enough… they HAD to make it emotional. Truth rarely ever needs emotion to be believed. Disgusting. And I see Jesus as an activist guru, a fundamentalist Jew leading a revival/revolt against the Western Occupation, an Osama Bin Laden trying to throw the pig-eating beard-shaving polytheist oppressors out of God’s Holy Land. I don’t think he was unusual in any way, except that his revolt caused less damage than most. “NT authors” includes Paul etc, who had very different views and motives regarding how to explain Jesus to Jews and to the Roman Empire. You got that right. The spike was designed to crucify by penetration. The Romans weren’t liberals, they believed in law-and-order and the power of deterrence. And they had to deal with barbarians round-about who impaled people. So they came up with a really brutal, tortuous siege-engine of the body.